There has been a lot of discussion recently about customer experience design and its positive impact on sales. However, this has mostly been done analytically, within the scope and boundaries of a company department, usually the marketing department, leaving the biggest returns on the subject untaken. Businesses are complex systems, as they are formed from different parts which interact with each other to maintain mutual existence and achieve common goals. They are also systems because each of their parts is crucial to the output and survival of the whole. Operations, accounting and marketing are, to a business, similar to lungs, heart and brain to a body. Let one fail and the whole system fails. As systems, businesses need to have a valuable output; an output that will be, in turn, transformed into an input to maintain the system’s existence. How these outputs and inputs are defined through time has been the study of management since its birth. This is where customer experience comes into the picture. People need continuous change for emotions to be created. Our brains do not react to static images or stable conditions. They are greedy and demand new experiences in exchange for positive feedback. We all know that the first drive of a new car gives us thrills soon to be forgotten and fade to routine, and that the first kiss can never be compared with the millionth one. Emotions are created by breaking barriers and offering something different, something unique, something better or more innovative. And, as customers change or become uninterested, as competition repositions itself and evolves, new and memorable experiences have to be designed and delivered in order to stay afloat. Customer experience is dynamic. In order to be able to realise this in an efficient way, a company needs to understand and anticipate needs, redraw its output and redefine its direction. First, there is a constant need for customer engagement, customer feedback and efficient customer relationship management. The demand for constant transformation means, in effect, that customer experience management pushes the whole organisation to be flexible and adaptable. So, companies aim to be lean and efficient learning organisations, where vision is shared, team learning is performed, mental models are challenged, personal mastery is achieved and – above all – systems thinking is practised. Customer experience also requires agility, as it is truly systemic. In order to optimise it, you need to carefully examine all the elements that build it up and fine-tune them and their relationships. Operations, supply chain and logistics, retail architecture and branding, HR and customer service, accounting and financing, marketing and sales; all these departments contribute to creating the offering itself and the experience generated by the company in its effort to sell. If one really wants to design better experiences, one must work with all departments to achieve this result. Furthermore, customer experience is collaborative. It begins when customers first hear about a brand and ends long after, when these customers share their experiences with others. Throughout this journey, organisations need to ensure a consistent flow of coherent experiences in all stages, including those that they do not control directly. When the complete customer journey is mapped, it forces companies to open up, collaborate with others, share visions, and extend their reach of customer feedback and monitoring. Finally, customer experience is truly social. During the last few years, a change in customer experience design has brought new heights to our clients’ businesses and has helped them adopt a wider viewpoint. Increased public interest in environmental and social issues has led to calls for companies to truly rise above shallow CSR programmes and prove their positive impact to society and the environment. This viewpoint escapes the boundaries of the system under review and seeks to identify valuable outputs and rewards within neighbouring systems. A great chance for us to implement the aforementioned attributes of customer experience was in our recent project: a new retail concept for the Kafkas chain of stores. Kafkas is the largest Greek electrical equipment, lighting and energy solutions company. It employs about 650 people, had a turnover of almost €100m in 2014, and currently has more than 45 stores through which it serves over 5,000 customers daily. Following the initial project stage of setting the brand’s strategy, our team designed the stores and operations, aiming to optimise customer experience and deliver a memorable in-store journey. 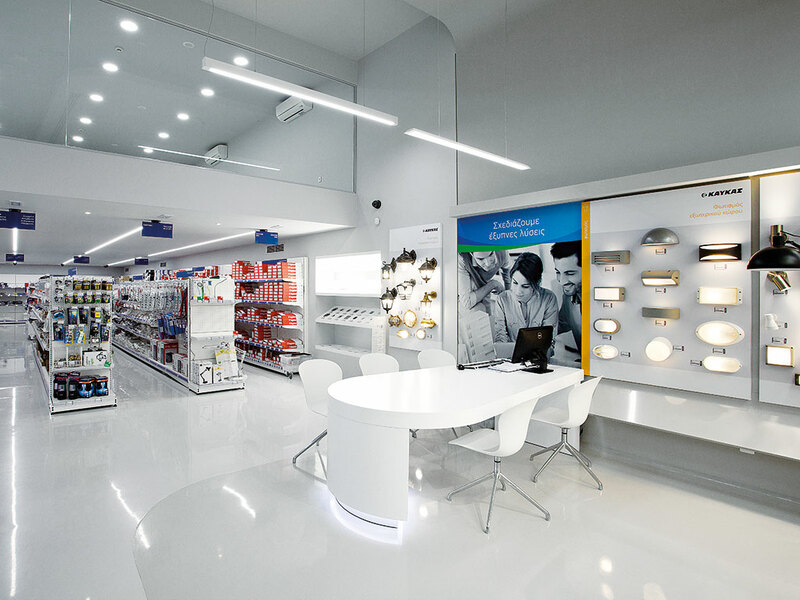 The main alterations, compared to the previous retail model, were operational and cultural; by replacing the service counter with booths, we made the service process faster and significantly increased the visited retail area, while the sales personnel changed their sales scenario from order-taking to consulting in an assisted-service model. After the concept was implemented in the first three stores, research showed that customer satisfaction reached 98 percent, proving the value of our solutions and design. Also, being a member of FEGIME, the European network of electrical wholesalers and retail stores, Kafkas presented the new concept at the recent 14th FEGIME Congress in Athens, as an example of best practice in the industry. It is obvious that by placing customer experience at the centre of your business model and operational design you achieve much more than happy and loyal customers. You also infuse the business with a culture of agility and turn it into a learning organisation, which ensures the sustainability of the business long-term. Optimising a company based on customer experience creates a meaningful, profitable and sustainable organisation. It is not by chance that all four pillars of sustainability have by now been covered: people, market, society and environment are all positively affected by a properly designed customer experience programme. At Stirixis Group, we believe every company can and should be profitable and sustainable. We work very closely with our clients, committed to the above direction, utilising a wide range of tools carefully aligned to define, design, deliver and develop their businesses through customer experience. We have developed and used this approach for years to create successful business concepts, fine tune and optimise existing ones, and develop them globally, and we have won numerous awards for our work. Our industry focus is mainly in retail, food and beverage, leisure, hospitality, and working spaces. Having completed more than 500 projects in Europe, the Middle East and Africa, we have acquired significant in-depth knowledge of different markets and different cultures. And, of course, we plan to keep optimising businesses in order to build a sustainable and prosperous society. Is it time to say RIP to the suit?